This article is about the demographics of the Ottoman Empire, including population density, ethnicity, education level, religious affiliations and other aspects of the population. Demographic data for most of the history of the Ottoman Empire is not quite precise. For most of the five centuries of its existence, the empire did not have easily computable valid data except figures for the number of employed citizens. Until the first official census (1881–1893), data was derived from extending the taxation values to the total population. Because of the use of taxation data to infer population size, detailed data for numerous Ottoman urban centers - towns with more than 5000 inhabitants - is accurate. This data was collaborated with data on wages and prices. Another source was used for the numbers of landlords of households in the Ottoman Empire- every household was assumed to have 5 residents. The first official census (1881–1893) took 10 years to finish. In 1893 the results were compiled and presented. This census is the first modern, general and standardized census accomplished not for taxation nor for military purposes, but to acquire demographic data. The population was divided into ethno-religious and gender characteristics. Numbers of both male and female subjects are given in ethno-religious categories including Muslims, Greeks (including Greek Macedonians, Asia Minor Greeks, Pontic Greeks, and Caucasus Greeks, all orthodoxal christians under the greek patriarchate from extremely distinct ethnic origin), Armenians, Bulgarians, Catholics, Jews, Protestants, Latins, Syriacs and Gypsies. 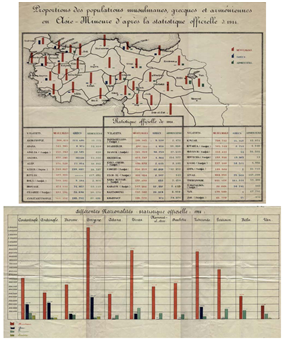 After 1893 the Ottoman Empire established a statistics authority (Istatistik-i Umumi Idaresi) under which results of another official census was published in 1899. Istatistik-i Umumi Idaresi conducted a new census survey for which field work lasted two years (1905–06). As a factual note this survey's complete (total) documentation was not published. Results of regional studies on this data were published later, which were sorted by their publication date. Included in the publication and subsequent ones was the Ottoman Empire's population as of 1911, 1912, and 1914. The substantial archival documentation on the census has been used in many modern studies and international publications. After 1906 the Ottoman Empire began to disband and a chain of violent wars such as the Italo-Turkish War, Balkan Wars and World War I drastically changed the region, its borders, and its demographics. 1893-96, Green shows Muslim majority, red shows Armenian majority. 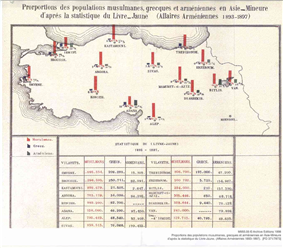 1914, Muslim, Greek and Armenian population. In 1867 the Council of States took charge of drawing population tables, increasing the precision of population records. They introduced new measures of recording population counts in 1874. This led to the establishment of a General Population Administration, attached to the Ministry of Interior in 1881-1882. Somehow, these changes politicized the population counts. Notes: a The Muslim Millet includes all Muslims. The largest of them being Turks, Arabs and Kurds. b The Greek Millet includes all Christians part of the Greek Orthodox Church. This includes Slavs and Albanians. c This includes the various Assyrian Churches. d The first source doesn't include Protestants and "others". During the World War I; The treatment of Armenians in the Ottoman Empire was a book by Viscount Bryce and Arnold J. Toynbee which compiled statements from eyewitnesses from other countries including Germany, Italy, the Netherlands, Sweden, and Switzerland, who similarly attested to Armenians in the Ottoman Empire during 1915-1916. The publication presents Arnold J. Toynbee's analysis on Armenian population in the Ottoman Empire. A summary table of his analysis included in the page 199. In the "vilayet of Van", there were two portions, portions in modern use corresponds to county. As explained by Arnold J. Toynbee in the footprint at page 199, he developed his analysis by excluding certain portions of the province where he said "Armenians were a minor". Arnold Toynbee in finding the ratio of Armenians in vilayet of Van; he removed the values originating from portions of Van (listed in the foot print) where Armenians were in minority. The presented table in page 1999 shows the re-calculated values by Arnold J. Toynbee of these selected provinces using values of the parts (counties, sanjacks) which Armenians were not in minority. The presented map shows the re-calculated values of the stated provinces using values where Armenians are not in minority. Ethnic values of the Six vilayets according to presented data. ^ Behar, Cem, ed. 1996. Osmanlı Đmparatorluğu'nun ve Türkiye'nin nüfusu, 1500-1927. Ankara: T.C. Basbakanlık Devlet Đstatistik Enstitüsü = State Institute of Statistics Prime Ministry Republic of Turkey. ^ McCarthy J. 1976. Nineteenth-Century Egyptian Population. Middle Eastern Studies 12.3: 1–39; Panzac D. 1987. The Population of Egypt in the Nineteenth Century. Asian and African Studies 21: 11–32. Shaw, Stanford. 1978. The Ottoman Census System and Population, 1831-1914. International Journal of Middle Eastern Studies (9):323-338.